AT&T Office@Hand for Desktop Head-Up Display (HUD) allows you to improve your business’ call management by providing a more convenient interface for receiving incoming calls and managing your extensions’ presence from the Office@Hand Desktop App. Single interface to manage incoming calls and presences from desktop. View up to 100 user extensions’ real-time presence status. Visibility of the currently active calls. Ability to pick up incoming calls on behalf of other extensions. Easy list management: add, delete and re-arrange extensions (drag and drop) in the HUD list. Automatically synced across desktop app and desk phones. Search Contacts within the HUD on dock and undock view. With the AT&T Office@Hand Desktop App HUD, you can monitor your colleague’s call with additional functionalities such as whisper, barge, takeover. Set up your account’s presence, and call monitor permissions to utilize Call Monitoring for the Desktop App HUD. For more information go to Call Monitoring for the Office@Hand Desktop App. 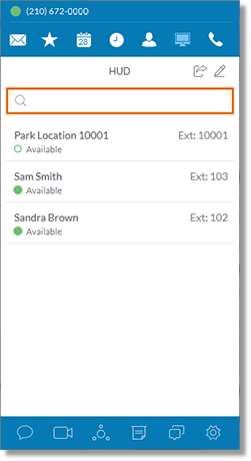 Park Locations is a feature on the AT&T Office@Hand Desktop App HUD that allows you to park a call privately that can only be answered by users within the group. For more information go to Park Locations for the AT&T Office@Hand Desktop App. For setting up Presence Permissions, go to Presence – Allow Monitoring on Users Extension | AT&T Office@Hand for more information. See links below to optimize AT&T Office@Hand Desktop App Head-Up Display features.